Our team headed out to Missouri on October 30th to attend the annual off-season event Cowtown Throwdown. Once we arrived, we quickly unloaded our equipment and had a lot of fun setting up the pit. As we prepared our robot for the start of qualification rounds, we also introduced many new members to FRC competitions and activities such as scouting. In addition, we created schedules and different materials to help new members learn more about the different events. 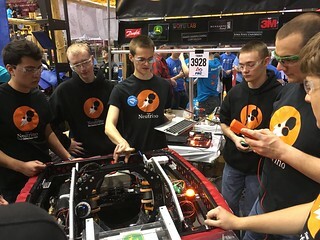 Once qualification rounds started, our new drivers got the chance to work with the robot. Many new members had a lot of fun trying out the different roles in the pit and around the competition. All of our drivers did an awesome job and gained a lot of experience. 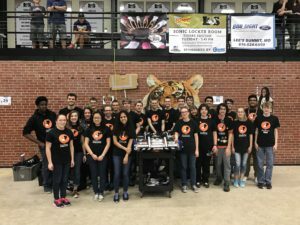 Our team had the honor of being chosen as the number two pick by the fifth alliance captain, 3937 Breakaway and competing alongside 1847 Ladder and 1775 TigerBytes. We had a lot of fun cheering on our team and watching our robot compete. 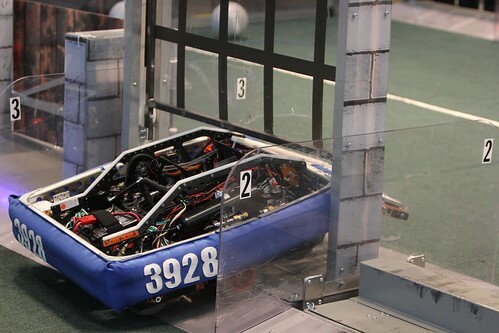 Our team’s hard work paid off, and we won our quarterfinals match and were able to make it to semifinals. 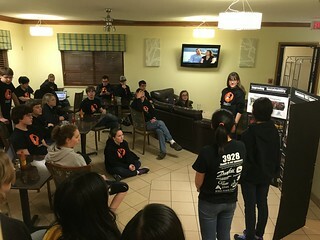 We had a lot of fun competing, and both old and new members alike learned a lot. Go team! Watch Team Neutrino compete at the 2016 Cowtown Throwdown!